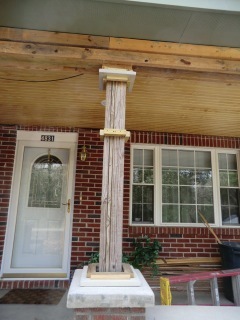 One of the thorny issue for me was to create the tapered columns using Hardiplank. I just couldnt figure it out until the solution came to me while swimming. 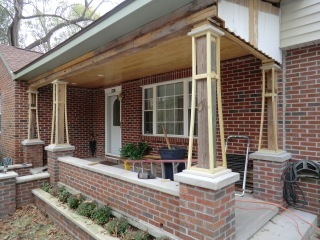 To install the hardiplank, there needed to have some sort of frame since it is only 1/4” thick. 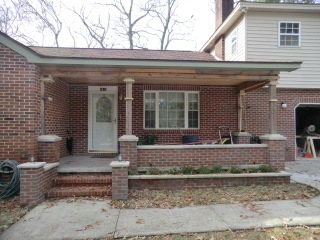 The top and bottom of the column caps were notched to receive the frame work. Then by installing a second ring around the column 18” from the top, it gave an additional point to attach the frame to pinch in the column. 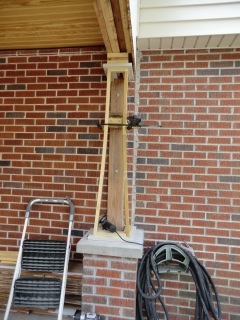 using a clamp, the frame could be pinched and secured to the second point in to create the the tapered look also lock everything into the column which made the frame really ridge. 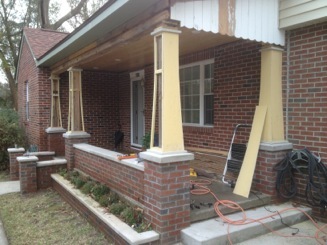 Now it is time to start the covering of the columns with hardplank.